Rapid tasting with easy preparation! Wash your potatoes and cook them in boiling water. Cut them lengthwise in half. Further cut a slice on their round part to make them stable on the dish. Then add one tablespoon of caviar. Serve with Champagne Rosé or Brut. 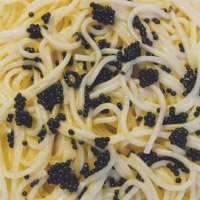 This dish combines the simplicity of pasta with exoticness of champagne and caviar. The result is remarkable. 1 pack of 500 gram fresh good quality spaghetti! Heat chicken bouillon; bring it to boil and add the Champagne, thyme, chives and nutmeg. Reduce to three quarters. Add cream and simmer for 5 minutes. Remove sauce from heat and transfer it in a pan of boiling water. Add butter, whisking vigorously, season with salt and pepper and add vinegar. Keep warm until ready to serve, and then add the caviar. Boil water in a large saucepan with ½ teaspoon salt and 1 tablespoon of oil. Cook the pasta according to instructions on package. Drain and transfer into a large warm bowl. Top with champagne sauce and caviar and serve immediately. Serve with champagne, a white Burgundy or a Pinot Blanc. 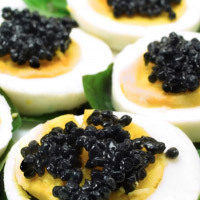 Keluga caviar is ideally suited to this recipe. Its taste perfectly combines with other ingredients. This dish offers a palette of colors that can be enriched by adding salmon or trout roes, into it. Boil eggs for 8 minutes. Dip them in cold water for a few moment, then unshell and cut them in the direction of length, using a sharp knife. Keep the egg whites separately. Hash yolks and add them to one of the two stuffing’s. Season with salt and pepper. Using a tea spoon, carefully top the whites with the stuffing of your choice, by flattening out the top. 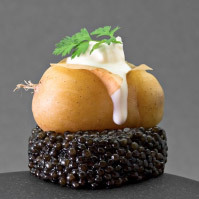 To serve, garnish with caviar.